When you arrive at Save A Warrior (SAW), one thing becomes clear: this is not the medical model. Many folks believe that the five-day ‘war-detox’ program means that Warriors are going to receive five days of therapy that will somehow change their lives. This is not the case. These Warriors aren’t receiving therapy or medicine at SAW. They’re receiving something much more powerful…initiation. Warriors receive knowledge that will save their lives and the lives of others. Some of this knowledge comes in the form of classroom instruction, but most of it comes in the form of experiences. The experiences vary widely, from archetypal discovery and group exercises, to equine assisted learning. There are also meaningful ceremonies and spiritual experiences, which in sum, amount to an initiation into manhood; or for our female Warriors, womanhood. All of the experiences focus on what is happening inside of the Warrior; inside of both the heart and the mind. With the knowledge gained during this initiation, Warriors develop a new lens with which toexperience the world around them and the things they experience going forward. If you’ve never seen the process, you’ll probably wonder how and why SAW works. First though, you’ll need to understand what is really happening inside of our Warriors. We often try to treat the wounds of war, without ever examining the root causes of the issues not presenting themselves. Many folks fail to recognize a few key facts about our Warriors: the first is that for many of them, there is a greater history behind their trauma apart from the war. Many Warriors grew up in poverty, experienced physical, sexual and emotional abuse, substance abuse, neglect, divorce, and other traumatic experiences that play a significant role in how they learned (or didn’t learn) to deal with things they experience in life. These things have an impact on the development of the brain (creating greater activity in the limbic system-see Part 1), which can result in more issues arising when impacted by trauma in war. The sum or our experiences in life formulate our BS… our belief (or false belief) system. What we believe about ourselves, others, and the world is crucial in understanding how we function as human beings. Looking inward and being aware of the beliefs we hold, and exposing the beliefs we hold that are false, is important if we are to overcome our struggles. Sometimes, we unconsciously believe things like, “I am a disappointment, I am not enough, there is not enough, I am a failure, or I am weak.” These false beliefs impact our ability to live to our full potential. 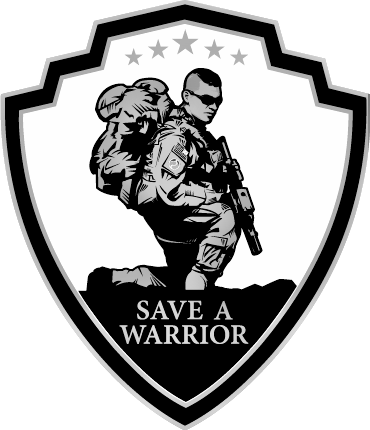 Save A Warrior’s program is designed to help Warriors increase their consciousness about themselves and others, and to evaluate those parts of their belief system that are false and highly destructive. A second key fact about our Warriors is that very few of them have ever been properly initiated, which is absolutely crucial for our society, but even more important to ensure that we are sending men and women into combat. Unfortunately, many of the Warriors that we have sent into Iraq and Afghanistan have been boys and girls. Karl Marlantes, who was a Marine Infantry Platoon Leader in Vietnam, as well as a graduate of Yale and a Rhodes Scholar at Oxford University, wrote a book called “What it is Like to Go to War.” The book evaluates his experience in combat in Vietnam, and why certain issues arise within us as we go to war. His chief observation is that we live in a society where the initiatory process has been forgotten. The price is that we are ill-prepared to deal with the consequences of combat. Marlantes points out that there are two broad categories of initiation experiences. The first prepares the individual to fulfill an adult role in society, which is partially what basic training does (what some call a pseudo initiation), although it does so in an unproductive manner. Instead of learning to “be afraid and do it anyways,” we learn to do things out of the fear of consequences. Because we train Warriors to numb their fear, they end up numbing all of their feelings, as it is impossible to do otherwise. The result is that we end up with numb Warriors, who struggle to empathize with others, or experience joy when they come home. The second initiation experience goes beyond societal roles and focuses on spirituality, which includes accepting one’s mortality and facing death, although it isn’t in the way you might imagine. The spiritual initiation must go far beyond attending church on Sunday. That’s religion. The spiritual initiation must take the boy or girl beyond their limits and into a place where they choose a new way forward that is absent of childish qualities. In place of selfishness, there is selflessness. In place of laziness, there is diligence. In place of drunkenness, there is access to emotional sobriety. In place of argumentative tendencies, there is wisdom. Unfortunately, our world has almost completely lost touch with the initiatory experience. Few tribes are left which still practice initiation as it has been practiced historically. While many military members might be quick to defend the military initiation process, one only needs to take a quick glance at the state of our military to see that something isn’t working. The military culture is plagued by violence, drug and alcohol abuse, sexual misconduct and abuse, divorce, and suicide. The experiential model at Save A Warrior incorporates a variety of experiences that amount to an initiation and gives Warriors access to a community of mutual healing which they can trust; a community where they will be met with unconditional positive regard; no judgments or criticism. One piece of the puzzle helps Warriors understand themselves and others. This helps them avoid and resolve conflicts in a healthy way. It also helps them successfully deal with others and begin to build trust with them. The archetypal discovery process, led by SAW’s Head of Experiential Healing, Philip Folsom, helps Warriors understand the tendencies they have as they work with others. Warriors discover that they tend to act, or react, in certain unproductive ways around other people; or what we call a ‘fixed way of being.’ Unfortunately, military culture and experiences in combat can cause Warriors to lose trust in others, have problems with authority, lose the ability to empathize, and communicate in a way that is rough in comparison to what civilians are used to. The result is that Warriors end up with communication problems at work, with friends, with their families, and in their marriages. By increasing the awareness of their tendencies (their ‘fixed way of being’) and the tendencies of others, they develop the ability to begin to work better with others. Once they are able to recognize the different archetypes that most people fall under, and how they can better communicate with them, they experience situations in which they can practice what they’ve learned. The two most significant of these situations is on the ropes course and in the horse pin. At the ropes course, Warriors learn to trust one another and how to communicate while doing “The High-V,” where they work with a partner roughly 30-feet from the ground. Because the exercise is also fear inducing, Warriors are encouraged to “recognize the fear and do it anyway,” which has a profound, positive impact on the confidence of Warriors suffering from Post-Traumatic Stress. The exercise requires communication and complete trust. For many Warriors, this is a valuable and life-altering threshold experience; the moment over which one never gets. The ‘Ah-ha’ moment that SAW is becoming noted for. In the equine round pen, Warriors experience two different exercises that increase their ability to communicate with others. SAWs Equine Assisted Specialist and Educator, Cheyenne Price, teaches Warriors to better understand how to communicate by working with horses. Horses are much like Warriors with PTS, because they are hyper-vigilant and tend to be stubborn. They are flight animals who have survived throughout history by paying attention to threats, perceived or real. Many of the horses at SAW are rescued or have a history of trauma, and Warriors sense a connection to them because of their similarities. The Warriors are given tasks to complete with the horses, but since the Warriors are not educated on how to communicate with the horses, it proves difficult and can be frustrating at first. Forcing the horses to do things can generate tension, but learning to be accommodating of the horses’ communication preferences can prove to be rewarding. Warriors walk away from the experience recognizing that in dealing with horses and people alike, they must learn to be patient and accommodating. The experience gives the Warriors wisdom to draw upon for the rest of their lives. Since a vast majority of the problems humans experience are a result of friction with others, learning to communicate and understand others is a crucial component of our lives. Furthermore, because we cannot expect others to be perfect, we must be accommodating and extend grace to others. We must “learn to be with that with which we cannot be.” Paradoxically speaking, we must accept responsibility not just for what we are responsible for, but also for the things we are not responsible for. Any initiation process must teach men and women to accept full responsibility in this manner, and it requires humility, which is the first requirement for a successful initiation. In doing so, we learn what it means to fully live, because we can begin to experience peaceful coexistence with others despite our disagreements. The SAW program helps the Warriors accept responsibility for their communications with others, by giving them the experiences, knowledge, and the ability to exercise good judgment; being able to be with paradox and ambiguity lies at the heart of any initiation or transformational experience. By learning how to better communicate and accept responsibility, we learn humility. Once we do that, we are ready for the next part of the initiation process, which is death. If you haven’t already read Part-2, visit it to learn about how Warriors at SAW experience a symbolic death which allows them to experience a new life and a new narrative. That is the key in helping Warriors overcome their present struggles and experience a life that is more hopeful and rewarding. Warriors crave a life of meaning, but as long as they are playing in mud puddles, they’ll never experience a life at sea. The symbolic death during the initiation to manhood or womanhood is the catalyst that gives new life to our Warriors, and teaches them the absolute necessity in leaving behind the things that no longer serve them, or others. After the Warriors are given new life, they are prepared to live out “The Five Pillars of Servant Leadership™”, which is access to the cure for PTS. It gives hope and meaning for the spirit, where meditation helps heal the mind (read about how meditation helps activate the body’s internal adaptive mechanisms in Part 1). In the coming days, you’ll hear about the power of The Five Pillars™ and their ability to transform Warriors in need of healing and the world. Save A Warrior is not the medical model. Only 16% of Warriors report that the VA’s treatment methods for PTS work. The same amount state that those methods made them worse. Like the electro-shocking abdominal device won’t give you six-pack abs, pills aren’t going to fix this problem. To heal, you have to do the work. Let me repeat that. You. Have. To. Do. The. Work. There is no other way. Nearly 100% of Warriors report that the experiential model, created by Save A Warrior, works. It changes lives. It saves lives. Over half of the Warriors who have been through the project had previous suicide attempts, and many more of them were on their way out. But, they’re all still here.